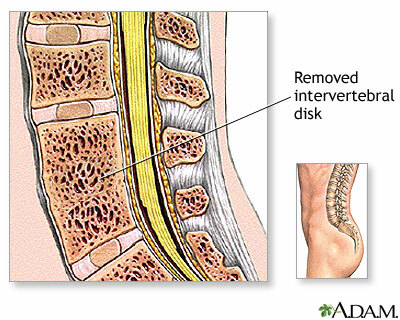 The disk may move out of place (herniate) or break open (rupture) from injury or strain . When this happens, there may be pressure on the spinal nerves. This can lead to pain, numbness, or weakness. With a slipped disk in your lower back, you may have sharp pain in one part of the leg, hip, or buttocks and numbness in other parts. You may also feel pain or numbness on the back of the calf or sole of the foot. The same leg may also feel weak. Spine MRI or spine CT will show where the herniated disk is pressing on the spinal canal. Diskectomy is surgery to remove all or part of a disk. Most people improve with treatment. But you may have long-term back pain even after treatment. Gardocki RJ, Park AL. 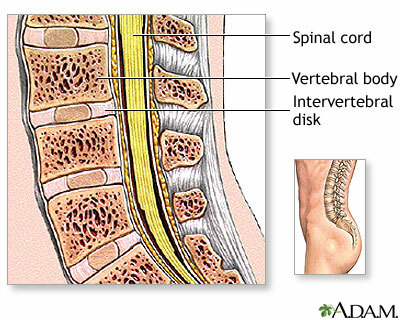 Lower back pain and disorders of intervertebral discs. In: Canale ST, Beaty JH, eds. Campbell's Operative Orthopaedics . 12th ed. Philadelphia, PA: Elsevier Mosby; 2013:chap 42. Magee DJ. Lumbar spine. In: Magee DJ, ed. Orthopaedic Physical Assessment . 6th ed. Philadelphia, PA: Elsevier Saunders; 2014:chap 9. Safran MR, Zachazewski J, Stone DA. 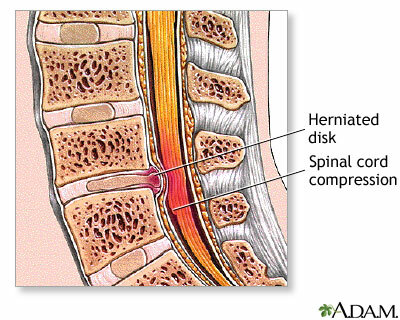 Herniated disk (ruptured disk). In: Safran MR, Zachazewski J, Stone DA, eds. Instructions for Sports Medicine Patients . 2nd ed. Philadelphia, PA: Elsevier Saunders; 2012:462-470. 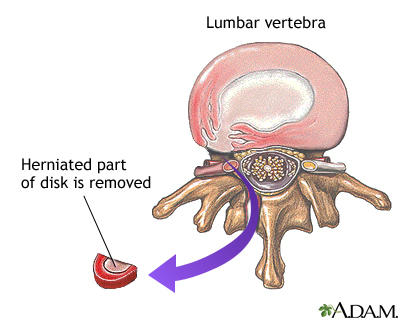 This animation shows displacement of an intervertebral disk (disk between the vertebrae). You might have heard a friend say that they have slipped a disk. Or, you may have slipped a disk yourself during an overly strenuous workout, or by straining while lifting something heavy. A slipped disk can be painful, so painful, in fact, that you can barely move. But what exactly is a slipped disk? And what can you do about it if you have one? 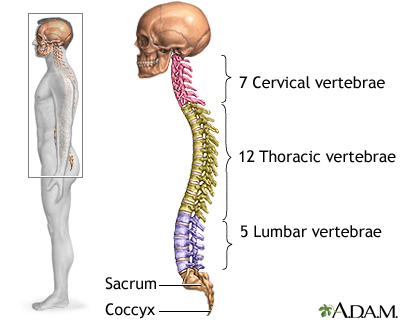 This is your spine. In between the bones, which are called vertebrae, are little cushioning disks. These disks not only allow you to bend and move but also prevent your bones from rubbing against each other. Sometimes an injury can push a disk out of place, producing a bulge. 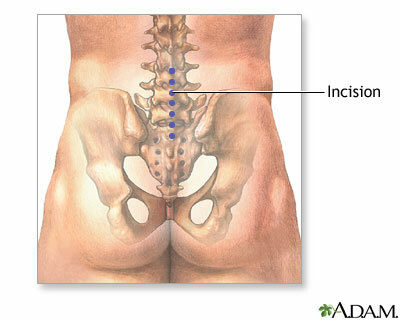 This bulge is called a herniated disk. Or, a disk may break open. When a disk moves, it puts pressure on nearby nerves, and that's when you start to feel pain. 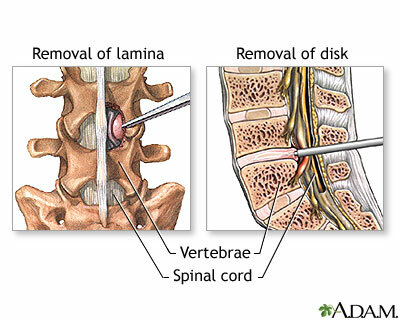 Most slipped disks are found in the lower back or lumbar region, although you can also have one in your neck, or cervical region. When you have a slipped disk, you'll hurt, but often just on one side of your body. If the disk is in your lower back, you may feel a sharp pain in one part of your leg, hip, or buttocks. Your leg may also feel weaker than usual. If the disk is in your neck, the pain and numbness can stretch all the way from your neck down to your shoulder and arm. You may notice that it hurts even more when you stand for a long period of time, or if you sneeze, cough, or laugh. So, how do you treat a slipped disk? First your doctor will want to make sure that you actually have a slipped disk. To find out, the doctor will check your muscle strength, feeling, and reflexes, and have you move in different ways, for example, by bending, standing, and walking. You may also have a scan to find the exact location of the slipped disk. While bed rest was once the standard therapy for low back pain, studies show that for most people it does not help and may even make the situation worse. Rapid return to healthy normal activity is usually best, being careful not to put too much stress on the back. While you're doing that, you can take medicines like ibuprofen or aspirin to relieve the pain. Muscle relaxants may also help. Acupuncture, massage, and yoga have also been shown to be affective in some studies. Physical therapy may be helpful after the first two or three weeks. It can help strengthen the muscles of your spine, and teach you how to move properly so you don't injure yourself again. If these measures don't help, your doctor may suggest getting steroid injections into the area where you slipped the disk, to reduce pain and relieve swelling. As a last resort when all other treatments have failed, you may have a surgery called a diskectomy to remove the damaged disk. You may be in pain now, but don't despair, with treatment it should ease. Realize that it may take a few months before you're back to your old self. Don't try to overdo it by bending or doing any heavy lifting. You'll just wind up back on your couch, hurting again. 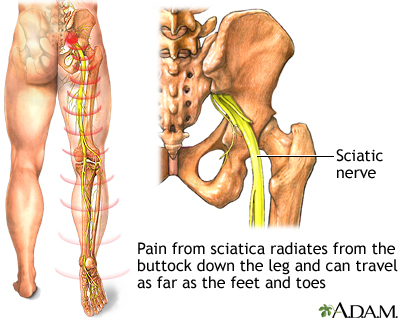 The main nerve traveling down the leg is the sciatic nerve. Pain associated with the sciatic nerve usually originates higher along the spinal cord when nerve roots become compressed or damaged from narrowing of the vertebral column or from a slipped disk. Symptoms can include tingling, numbness, or pain, which radiates to the buttocks legs and feet. Herniated nucleus pulposus is a condition in which part or all of the soft, gelatinous central portion of an intervertebral disk is forced through a weakened part of the disk, resulting in back pain and nerve root irritation. When the soft, gelatinous central portion of an intervertebral disk is forced through a weakened part of a disk, it is a condition known as a slipped disk. Most herniation takes place in the lumbar area of the spine, and it is one of the most common causes of lower back pain. The mainstay of treatment for herniated disks is an initial period of rest with pain and anti-inflammatory medications followed by physical therapy. If pain and symptoms persist, surgery to remove the herniated portion of the intervertebral disk is recommended.